As part of our sixth annual Facilities of the Year Competition, we salute a remarkable group of facilities that represent a variety of backgrounds and geographical areas. These five facilities, however, have one thing in common: they are leaders. Our award winners have used innovative approaches ranging from water recycling programs to hazardous waste reduction initiatives to wetlands restoration in order to protect the environment and promote their companies' financial success. We all need to learn from these leaders - and become leaders ourselves. 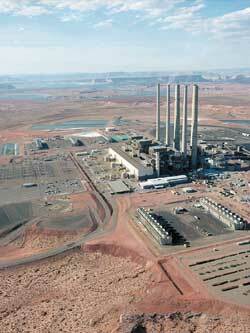 The Navajo Generating Station (NGS), the eighth largest coal fired U.S. power-generating station, was completed in 1976 with environmental concerns in mind. For example, NGS's water process is zero discharge. Cooling tower blowdown, all wastewater and the majority of the stormwater is recovered and reused in the plant process. In addition, the plant has always burned low sulfur coal and recently installed sulfur dioxide scrubbers to control hazardous air emissions, which makes the facility one of the cleanest burning coal fired plants in the country. In the early 1990s, plant management began taking decisive steps to reduce or eliminate hazardous materials and hazardous waste at the facility. In 1991, NGS generated 39,037 pounds of hazardous waste. In contrast, by 2000, the plant generated a total of 1,793 pounds. NGS is now classified as a small quantity generator of hazardous waste and is aiming for reclassification as a conditionally exempt generator. The facility has been honored several times for its environmental efforts. In 1993, NGS received the Arizona Clean and Beautiful Governor's Pride in Arizona Award for Environmental Leadership for innovative waste management programs. In its July 2001 issue, U.S. Industry Today magazine recognized the plant for its reliability, safety and environmental performance and community involvement. The BASF chemical manufacturer is committed to maintaining strict compliance with applicable environmental laws. Since 1987, the facility has decreased its annual air emissions 97 percent. This was accomplished through the installation of a styrene recovery system and the implementation of a fugitive emission-monitoring program for more than 5000 mechanical components to minimize emissions. BASF has chosen to relocate a wetland area onsite, rather than move it to the traditional wetlands banking areas outside of the facility's watershed. This relocation project has increased community awareness of the fragile wetland ecosystem. Specifically, it has sparked local research projects with institutions such as the Tennessee Aquarium, the Southeast Aquatic Research Institute, the University of Tennessee at Chattanooga, and the Land for Public Trust, as well as local middle and high school students. The facility has received numerous awards. These include the 1994 and 1998 Environmental Excellence Awards for achievements in air quality from the Tennessee Association of Business; the 1998 "Pretreatment Excellence Award" from the Kentucky-Tennessee Water Environment Federation; and the 1998 "Industrial Pretreatment Award" from the City of Chattanooga. The Naval Air Station (NAS) takes an active role in preserving the Chesapeake Bay, the largest estuary in North America and one of the most productive in the world. NAS has created the Environmental and Natural Resources Support group, which consists of 30 full time staff members who focus on protecting the Patuxent River and the Chesapeake Bay while supporting the military mission of NAS. Environmental staff members have developed cooperative relationships with many agencies. For example, NAS and the U.S. Fish and Wildlife Service (USFWS) have agreed to conduct station-wide assessments. USFWS provided the NAS environmental team with a classification of each stream, stream channel stability and erosion potential, a biological assessment and prioritization and recommendations for restoring these streams. The members of the NAS support group frequently give educational presentations to local school groups, scout troops and civic organizations. The environmental team also provides the community with documents, informative brochures and other educational materials in information centers located at local libraries and on NAS's environmental Web site. NAS has been recognized by numerous groups for its achievements in stewardship of the Chesapeake Bay area. Some of the awards include the 2000 Chief of Naval Operations Environmental Restoration Award, 2000 National Arbor Day Foundation Tree City USA Award, 1999 Secretary of the Navy Natural Resources Conservation Award and the 1999 Maryland Recycler's Coalition Government Leadership Award. Baxter Healthcare Corporation,a facility that manufactures medical devices and intravenous solution, has a long-standing commitment to protect the environment from hazards inherent in the company's activities. For example, in order to improve the quality and reduce the volume of the process water discharged at the facility, the environmental management started recycling the waters used in several of the facility's operations to feed the boiler room. Through these steps, the facility has eliminated in some cases, reduced the volume in others and improved the quality of the discharged water, including the domestic/sanitary waters. To reduce the amount of solid waste, the environmental team implemented an aggressive recycling program. As result of their efforts, in 2000, the plant achieved an 11 percent reduction in the poundage of waste generated per hour of production, using a base year of 1996. In addition, from 1996 to 2000, based on production hours, the plant experienced reductions of 12 percent, 4.7 percent and 10.3 percent for hazardous waste, energy consumption and air emissions, respectively. The plant was accepted as a charter member of the U.S. Environmental Protection's National Achievement Track program in December 2000. More recently, the Water Environment Federation and the American Water Works Association recognized the facility with the award, "Best Industrial Wastewater Treatment Plant" for its water treatment system and recycling. The commercial printing company is committed to excellence and leadership in sustainable development practices. For example, its new method of recovering spent cleaning solvents from soiled shop towels became EPA's top case study in the agency's Design for the Environment Project. In 1995, the company was one of just 12 companies nationally selected to participate in EPA's Environmental Leadership Pilot Project in which it mentored its environmental management system to a series of smaller printers. In addition, the company was one of the first companies to get the Minnesota Green Star recognition for publicly disclosing the results of its environmental audits. The printing facility has participated in numerous other special programs such as EPA's Common Sense Initiative, the Printers' National Environmental Assistance Center, EPA's 33/50 Program for toxics reduction and the US-Asia Environmental Partnership. In 1992 and 1997, the company received the Minnesota Governor's Award for Excellence in Pollution Prevention. Other awards include the 2000 Minnesota Environmental Initiative Environmental Policy (improving environmental policy) and the 1998 Minnegaso Environmental Leadership Award (energy conservation). It also was selected to participate in EPA's new Performance Track Program. Thurston Manufacturing Company, Thurston, Nebraska, a small manufacturer of farm equipment, received EPA Region 7's 2001 Environmental Excellence Award for Pollution Prevention in the use of environmentally preferable products and services. Grand Canyon National Park Lodges (GCNPL), Grand Canyon, Arizona, is operated by AmFac Parks & Resorts, which received a 2001 U.S. Department of Interior Environmental Achievement Award and the 2001 Travel Industry Association's Odyssey Award (Environment). AmFac was recognized for its efforts at GCNPL and three other facilities. Boeing Corporation, Seattle, Washington, recently received the State of Washington Governor's Award for Pollution Prevention and the King County Department of Natural Resources' ENVIRO Award for innovation in pollution prevention. Do you anticipate that your facility will be formally recognized in 2002 for pollution prevention strategies, innovative design or other environmental accomplishments? If so, please let us know and we'll consider it for the title of one of our next year's Facilities of the Year, which will be covered in our December 2002 issue. Every year we single out the top industrial plants, water and wastewater treatment operations, landfills or other types of facilities that have been recognized for outstanding environmental achievements by governmental regulators, trade associations or other professional groups. The deadline for submissions for next year's competition will be August 1, 2002. If you're interested, please contact Angela Neville, editor-in-chief, aneville@stevenspublishing.com or (972) 687-6721. This article originally appeared in the December 2001 issue of Environmental Protection, Vol. 12, No. 12, p. 12.